Hmmm… seems that it depends. If your dog just finished digging up and chewing an old bone that he had buried in the back yard last week, well…. hopefully your mouth is cleaner than that! But is it a good idea for your dog to lick a wound, either his or yours? Nope. Studies have shown that both dog and human mouths contain more than 600 different kinds of bacteria, and that’s not something to add to any wound. Fact: the mouths of dogs and humans are equally dirty! So use your first aid kit, for you and your dog. And don’t let your dog lick himself much, as it’s easy for him to create a hot spot, and a much bigger problem than just the wound. Adult dogs have 42 teeth, but puppies, who don’t get molars, have only 28. Humans? 32. Dogs rarely get cavities, as they usually consume very little sugar. Additionally, their teeth don’t have much in the way of flat grinding surfaces, which in humans are very effective at trapping bacteria laden bits of food. Few cavities, perhaps, but dogs are very susceptible to periodontal diseases, and many veterinarians say that the majority of dogs aged three and older will have some kind of dental problem. 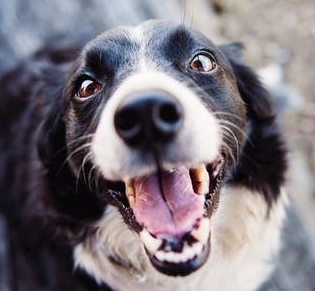 Taking care of your dog’s teeth can extend his life by as much as five years. Why? Because the bacteria associated with periodontal disease causes inflammation and infection and also adversely affects vital organs, including heart, kidneys, and liver. The most common sign of periodontal disease is bad breath. Dogs don’t have much of a taste sense, having only about 1,700 taste buds, as opposed to humans with about 10,000. That’s a big difference. Maybe that’s what some of that vile smelly stuff seems to taste good to dogs! If you think that your dog slobbers a lot, and you always seem to be cleaning up after him, it might be true. A medium sized dog can produce up to four cups of saliva a day! And some breeds have even greater production. 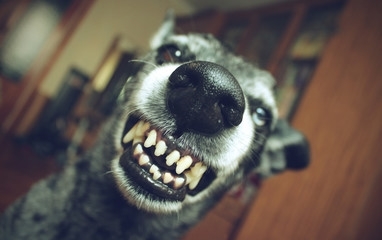 Dogs have a much greater bite force that humans, ranging from 250 to 325 pounds per square inch, compared to around 170. But dogs pale in comparison to lions, tigers, and hyenas, whose bite forces have been measured at about 1,000 psi. And the salt water crocodile? A mind boggling 3,700 psi! Dogs pant to cool themselves down after exertion or on a hot day. They only have sweat glands on the pads of their paws and their noses, and panting is needed to get rid of excess body heat. Try to count the breaths taken by a panting dog, it’s somewhere in the range of 300 to 400 per minute, compared to a normal range of 30 to 40. Most dogs have pink tongues, although Labradors and Golden Retrievers frequently have black spots on their tongues. 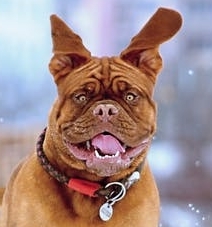 Some breeds such as the Chow Chow and the Shar Pei have blue tongues. Eating, drinking, panting, licking, biting, chewing, and some say smiling… a lot goes on with a dog’s mouth and its various parts. Let us know if we’ve missed anything that you find interesting.